I consider the essence of the Craft Art is to show and make the best out of the material. The beauty of the material itself is very important aspect of my work. 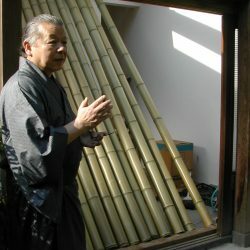 In order to achieve this, I do entire process of preparing the bamboo by myself, so that I can have a greater control over what I am working with. I use the bamboo that grow on my mountain and process them traditionally. I cut my own bamboo during the cold winter usually in January or February. After cutting them, the first step is to stand them up in a well-ventilated place for 100 days or so to dry them naturally. Secondly, I leach out oil and sugar content of the bamboo by heating. After that, I dry them further in my special hot chamber for 20 days. At this point, the bamboo becomes a clean ivory color and increases its luster. This is the color I would like to achieve, and doing these process decrease the chance of mildew and nesting insects. It is a painstaking preparation work, but I like to show the real beauty of “white bamboo.” You can also boil the bamboo in alkaline solution to achieve a somewhat similar result, but it is not just the same. I use the bamboo very straightforward. I use the beauty of its own color and compose my work in the way to make the best out of its resilient nature. In my mind, I have this image of “transparent quality” in my bamboo work like a work of glass. That “pureness” is what I always look for. Unlike the other materials in Craft Arts, you can express the beauty of “openness” in the bamboo art.